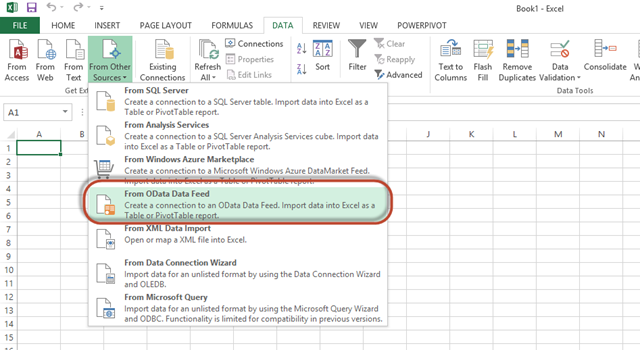 In this post, we’ll create the appropriate data connections to pull the data from Project Server OData into Excel 2013. To do this, we first need to do a bit of analysis on the required data. As we already have a working version of the report using SQL queries, we can break down the technical requirements relatively easily. Total Date is a field that we will create that displays the beginning of the month for any given date. In this case, we have two data sets that we need to map to the same month: the task baseline finish date, and the task forecast finish date. Essentially, we’re going to count how many tasks were baselined to finish in any given month, and then compare that to how many tasks are forecasted to finish in that month – as well as any tasks that actually completed in that month. Each of the dimensions is captured from an OData feed. 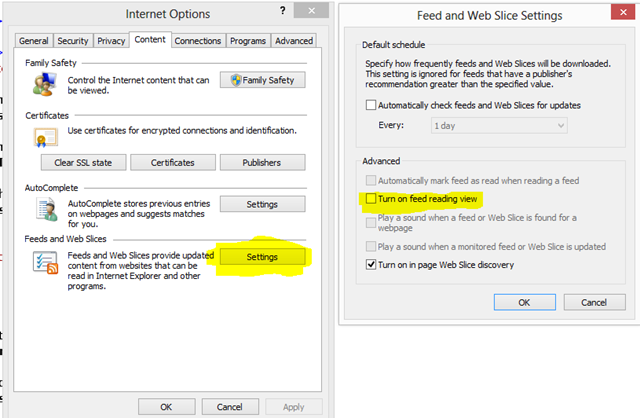 Below, I’ll show how I developed the feed in LINQ, and then what the resulting URL was. As I mentioned in the last post, you can skip the LINQ development and simply modify the data in Excel PowerPivot, but it was quicker to just add the filters and select the fields in the query itself. Let’s create a table with the project name. We can use this field to filter our report at the project or program level. We also need the first day of the month within which any work may occur. We can do that using the TimeSet feed. That contains a list of the days on which work may be scheduled within Project Server. I filter out every value but the beginning of the month. 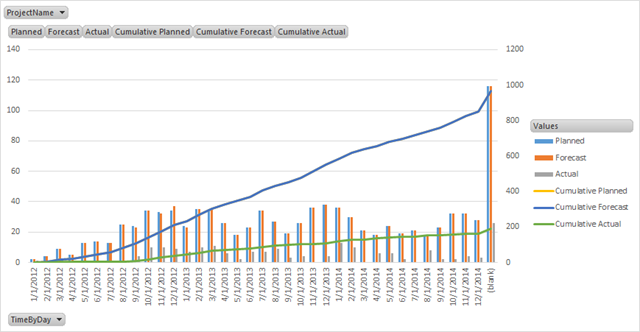 We now need to add two more data sets to provide the baselined finish dates vs. the current forecasted finish dates. We need to split these up into two data sets because we may have had a task that was baselined to complete in March, but is now scheduled to complete in April. Hence, we need to have the task show up in both months in the correct columns. In SQL, we could handle this using a UNION command. With PowerPivot, we’ll take a slightly modified approach. Forecast & Actual Finish are fairly straightforward. We’ll get them from the Tasks table. The Baseline Finish field is treated a bit differently in OData than in SQL. In SQL, I have a nice table with all of my task data to pick and choose from. In OData, the baseline data is pushed off into a table by itself, i.e. I have one field for BaselineFinishDate – and 11 different rows for Baselines0-10.. This necessitates adding a filter to only pull baseline data for Baseline0. For the moment, I am filtering for milestones by only selecting those rows with a baseline duration of zero. When prompted, select the option to Only create the connection. 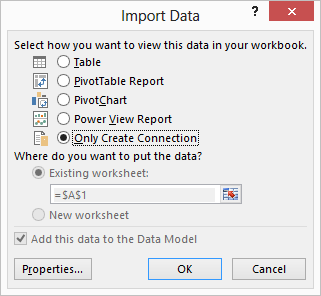 Next up….creating the data model in PowerPivot. As part of my preparation for the upcoming SharePoint Conference, I decided to embark on an exercise to port some of my more popular reports over to OData and Project Server 2013. Indeed, it turned out to be quite the mental exercise – and hopefully I didn’t end up with the cranial equivalent of a stress fracture. Not that, in retrospect, it was hard. I think it was more difficult to get my head around the new concepts and models required than actually doing the work. So first off, a macro level view of things. Where the 2010 business intelligence story was really about empowering the end users, the 2013 story, is basically that – and more. The critical difference in 2013 is that instead of simply presenting a massaged data set to the end users in the form of data connections, and then allowing the end users to develop reports; now, we’re presenting the raw data to the end users and then allowing them to create the data model in Excel. In fact, when you start looking at Excel 2013, you can see substantial investment has been made in PowerPivot, and in porting a rudimentary SQL query design editor UI into Excel. I can now take the raw data from SQL and then manipulate it at a base level in Excel before even bringing it into the familiar Excel worksheet interface. The report I decided to start with was one I originally discussed here. It’s relatively uncomplicated, i.e. it doesn’t require custom fields, but it does require a combination of baseline data, and some fancy footwork to compile multiple data sets. For those of you reading this with on-premises installations, feel free to use those instructions as you’ll have direct access to the SQL data repository. These instructions are only for those who have their data in the Project 2013 cloud based model –or- for some reason have determined that you’d like to pursue using the OData interface to consume project data. There’re a couple of tools that we’ll use to develop this report. Primarily, we’ll be using Excel 2013. 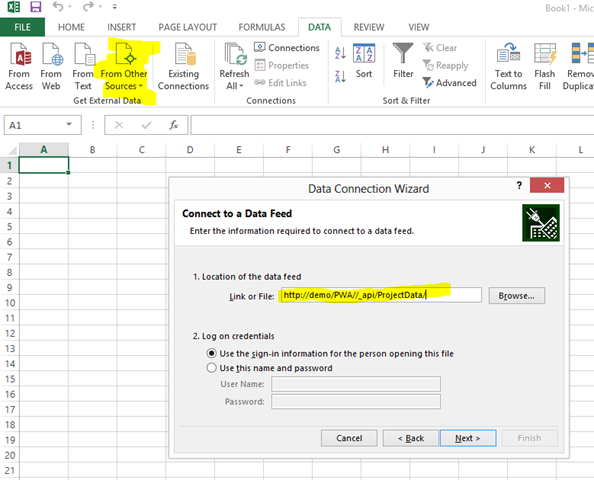 Out of the box, Excel 2013 can now import data from OData feeds – whereas this required the install of the free PowerPivot for Excel add-in for Excel 2010. 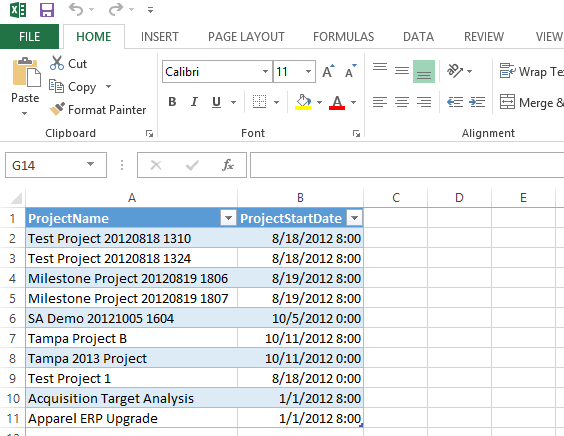 PowerPivot comes installed as an optional add-in, which we need to activate to modify the data model. So let me state this very clearly: you don’t need PowerPivot installed to consume OData, but if you want to build relationships between the data tables and manipulate the structure, you’ll need to activate the PowerPivot add-in. You’ll find it under Options > Add-Ins > Com Add Ins. I would assume that these instructions should work equally well in Excel 2010 with PowerPivot, but haven’t validated that. Feel free to add your experiences to the comments below. The second tool would be a working instance of Project Server with the OData feed validated. Navigate to the appropriate URL to confirm that you see the right data. Finally, it’s not really a requirement, but I found it helpful to have a working instance of LINQPad available. 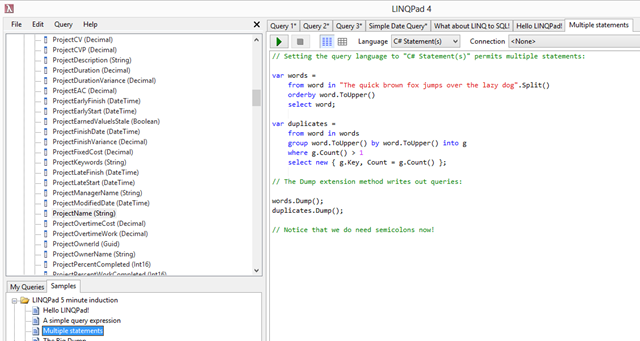 LINQPad is a free tool that you can use to generate LINQ queries and then to turn those queries into a URL to query OData. You don’t need LINQPad, but I found it saved a bit of time, i.e. I could filter the result set and select the fields before pulling them into Excel. Otherwise, you need to pull them into Excel, and then select the columns. If you’re comfortable with simple SQL queries, you’ll probably just find it easier to specify the fields in the query itself. 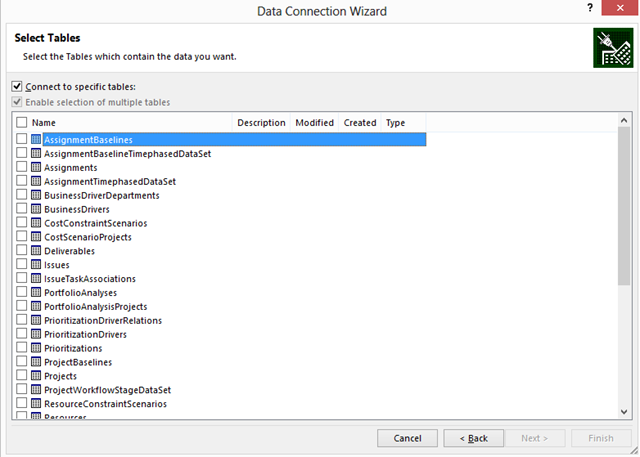 Next up….setting up the data connections within Excel. UMT (and yours truly) are taking to the road to spread the gospel of project & portfolio management. We’ll be in Tampa, Atlanta, and Charlotte in the coming weeks. Come on out. DON’T MISS this opportunity to learn from the industry’s most progressive companies on the benefits of Enterprise Project and Portfolio management! Join Microsoft and Project Portfolio Management industry leaders for a day of valuable and useful information on Microsoft Project 2010 including customer keynotes, business and technical presentations, lunch and a preview of what’s is next for Microsoft Project Server. Please choose a convenient date and location and click the button to register. More information and complete agendas are available on the registration pages. Come on out to SharePoint Saturday San Antonio this weekend where we’ll be partnering with Microsoft to present the latest and greatest on Project Server 2013…..or just stop by the UMT table to talk project & portfolio management or TFS integration.